From mountains to lakes, there's no terrain that Mango doesn't enjoy. An orange tabby named Mango is changing minds about what it means to have a pet cat. 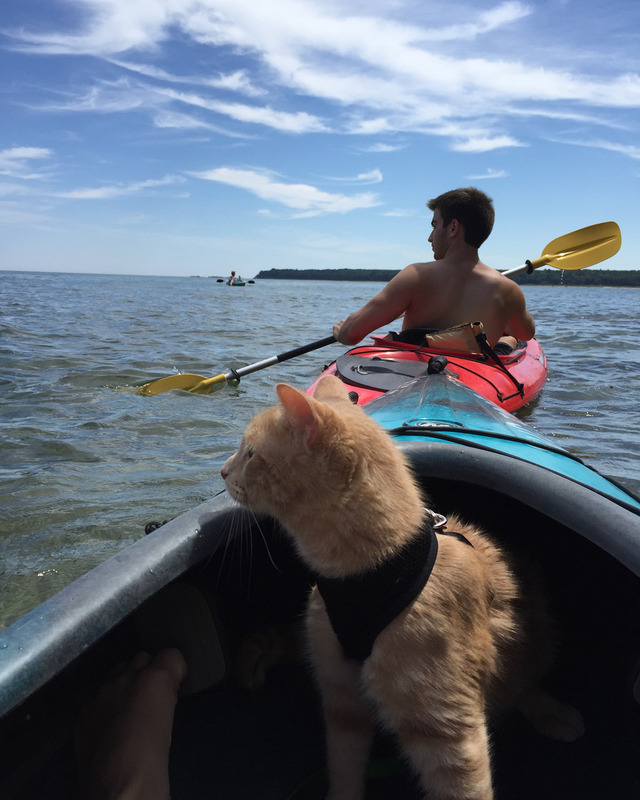 The fearless feline, who hails from Michigan, loves to explore both land and water with his outdoorsy humans, and people are taking notice. 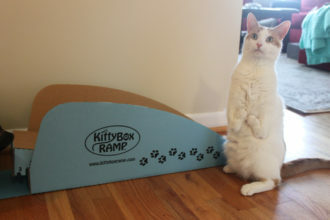 We recently talked to Yasick about Mango and how he became such a courageous kitty. Adventure Cats: Tell us a little about Mango and why he’s such a special cat. 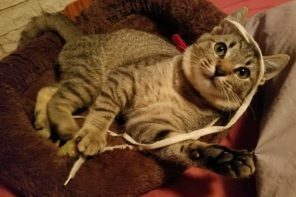 Megan Yasick: We adopted Mango a little over a year ago. We were looking to adopt a companion pet at the time and found a litter of kittens through a system of foster homes. Within minutes of meeting the litter, we knew Mango would be coming home with us. He was so energetic, playful and unafraid. I think part of what makes him such a special little cat is that he has a genuine curiosity and willingness to do the activities that we do. He is happy to explore, but also content to just hang out with us while we eat lunch on the trail. I think that he has a sincere trust and bond with us and that helps to make camping and hiking with him so easy and enjoyable. How did he start accompanying you on outdoor excursions? We started leash training Mango when he was about 4 months old. His first hikes followed in the months after that. We took him on his first camping trip this past summer at about 8 or 9 months old. 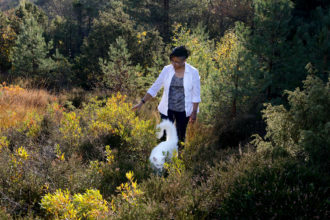 We really enjoy outdoor activities such as camping, hiking, canoeing and kayaking. It broke my heart to leave Mango behind while we went out and got to see the world. 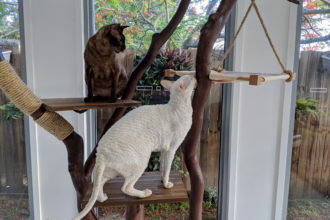 After reading an article about Burma the adventure cat, I became even more convinced Mango could handle these types of excursions. So we did some training with him and slowly started to bring him with us. He was an absolute natural! He was bothered by very little and took everything in stride. He’s accompanied us on almost every hike and camping trip since. What’s a typical excursion like with Mango? We always pack an empty backpack for Mango. 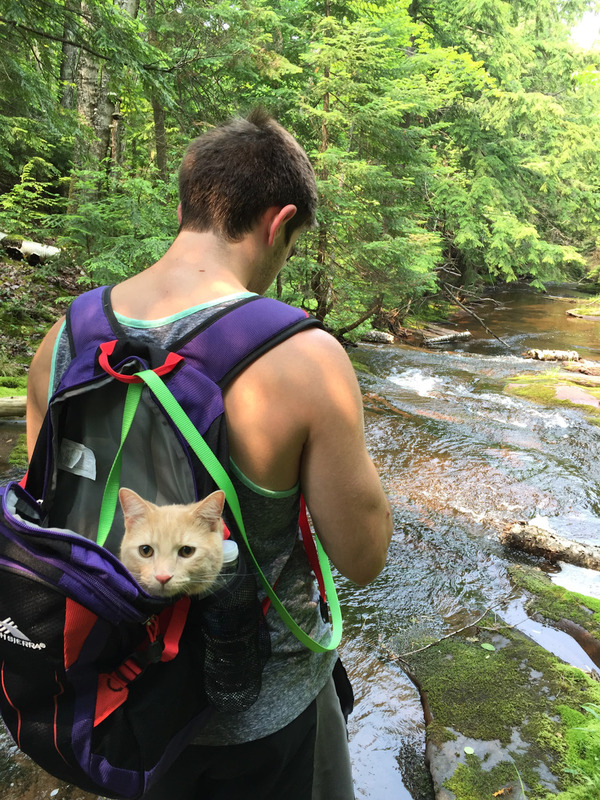 He splits his time between hiking alongside us and hanging out in the backpack. He is very good about telling us when he is tired and needs to rest. 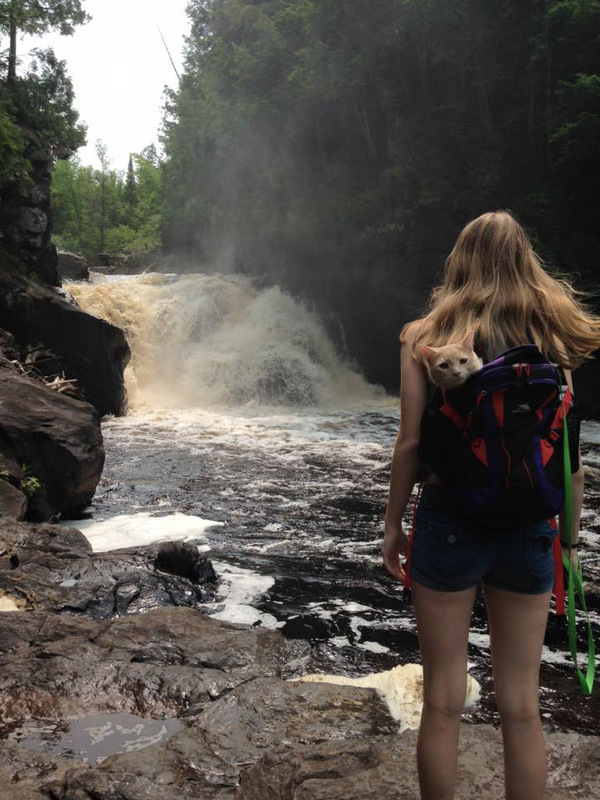 He will often pause or sit for a few minutes for a backpack ride. When he is ready to go, he jumps down and out of the backpack and keeps trucking. On most hikes, we walk in a line. Chris walks in front, Mango walks between us, and I walk behind Mango. We have found this to be the most encouraging arrangement for Mango. I think it has helped him to remain at ease and learn to trust us as we visit new places. 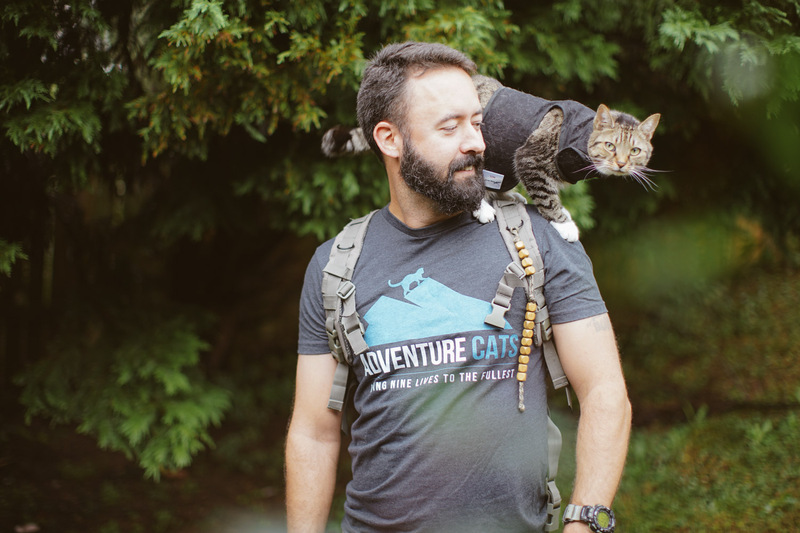 What’s the best part of adventuring with a cat? Are there any disadvantages? The best part is honestly the fact that he does adventure. He is so willing and eager to accompany us. It’s awesome for us because we can bring our companion wherever we go and he gets to see the world with us. We don’t need a cat sitter because he can do it all. 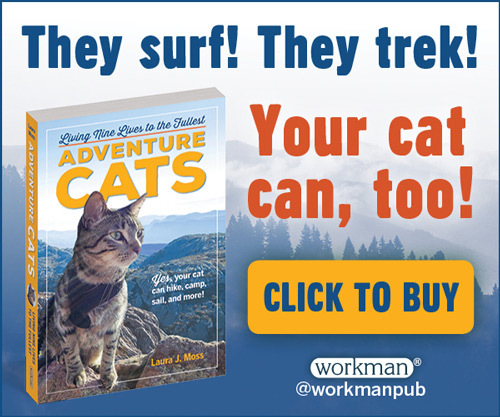 As wonderful as having an adventure cat is, there are some challenges. Though he is leash trained and does awesome on the trail, he tires easily. He trots to keep up with us, so he needs breaks at pretty regular intervals. I think the other hard thing is that cats can dehydrate pretty easily and aren’t always comfortable eating and drinking in new environments. We have had to come up with some creative ways to keep him hydrated. We carry wet cat food with us during any and all activities. If it is hot, we pour water over his fur to keep him cool and for him to lick off to stay hydrated. Mango is also still learning to do his business outside. He is often apprehensive to try which can be difficult, but he is learning. Even so, the benefits of taking him on adventures far outweigh any challenges we have been presented with so far. What’s one of your favorite memories with Mango? On one of our most recent camping trips to Kentucky, we were hiking along a cliff face. There was a shallow cave in the wall full of ledges protruding from the rock. We decided to take a break next to the cave to refuel. Mango waited with us for a minute and then hopped up into the cave and onto a ledge. He hunkered down, tucked his paws and just looked out over the valley. He was so peaceful and so obviously happy. It was just a huge affirmation that taking him on adventures was the right thing to do. Did you do any training with him? We did a lot of training with Mango. 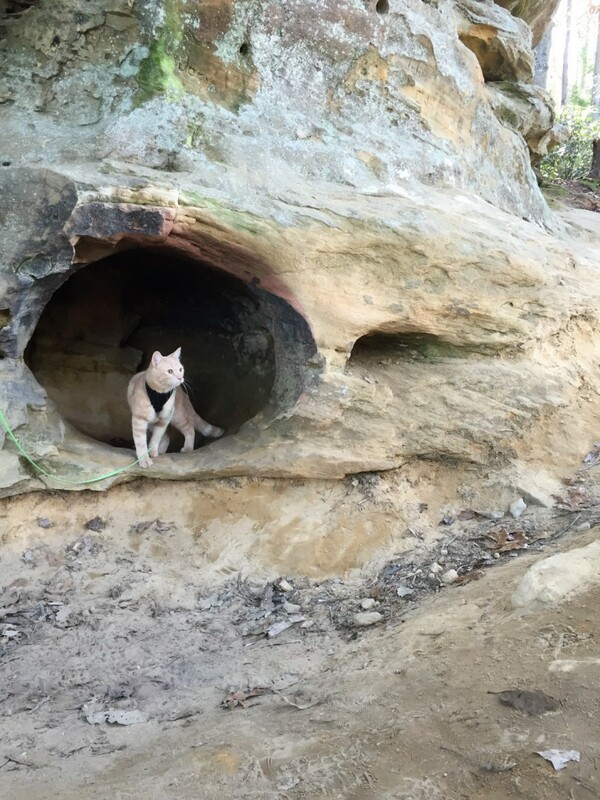 His curiosity and energetic attitude gave me the first clue that we could take him out hiking with us, but I wanted to make sure he was prepared and comfortable before we did. 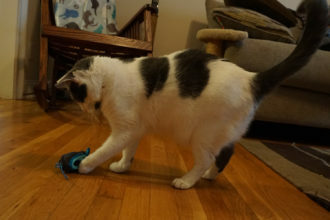 Initially, he wore a harness indoors every day for a few hours until he was comfortable. I then started to take him outside in the backyard on a ground spike and 15-foot leash. I would sit within the radius of the leash and let him explore and look around on his own, but still supervised. This way we could keep an eye on him, and if he was scared, he could come sit with us. When it was obvious he was relaxed in this setting we started going on very brief walks and slowly moved to short hikes. From there, he graduated to longer and longer hikes, and now he’s a pro on the trails. Do you have any special gear just for Mango? He has a ton of Mango-specific gear. 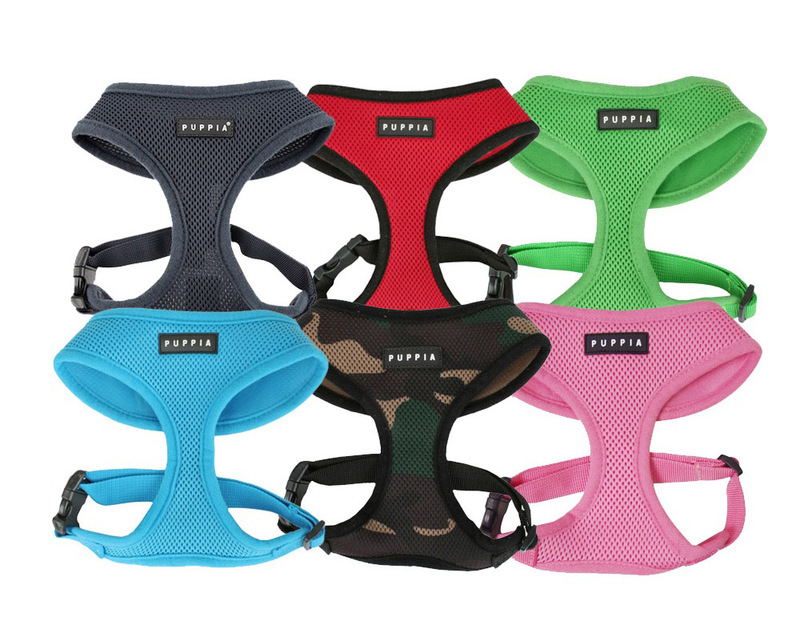 He has a fitted vest-like harness and a leash. His harness is tagged with my name and phone number. 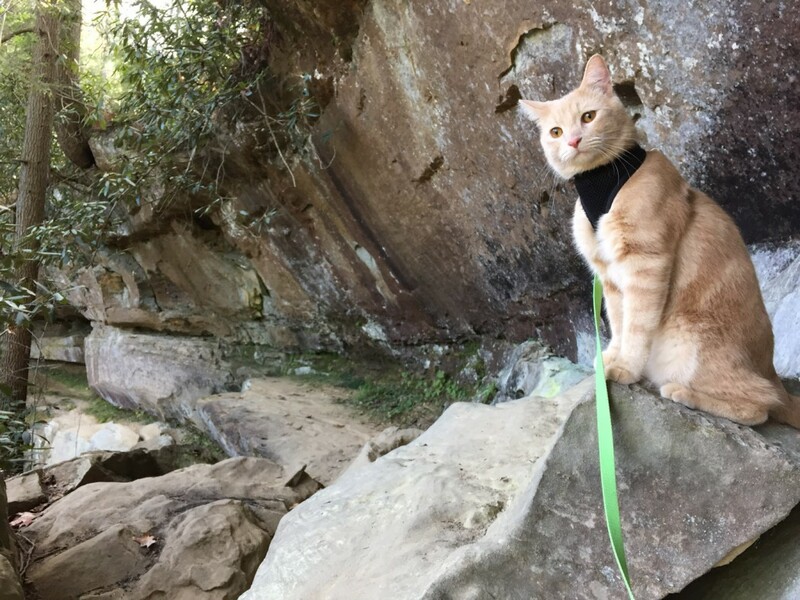 Mango is never off his harness and leash when we go exploring. He also has a parka for the winter months and a life vest for when we go boating. What kind of safety precautions do you take? When we are in bigger forests I sometimes tie a bell to his harness to help scare off predators and make our presence known, though we have never encountered any large animals. We also make sure Mango is getting regular doses of flea and tick medication so he doesn’t run the risk of getting bugs or diseases from bugs while we are out. What effect has adventuring with Mango had on you? For us, it has made adventuring an even more fulfilling experience. I think Mango leads a happier life because of it too. He gets to exercise and explore regularly in a really cool way. 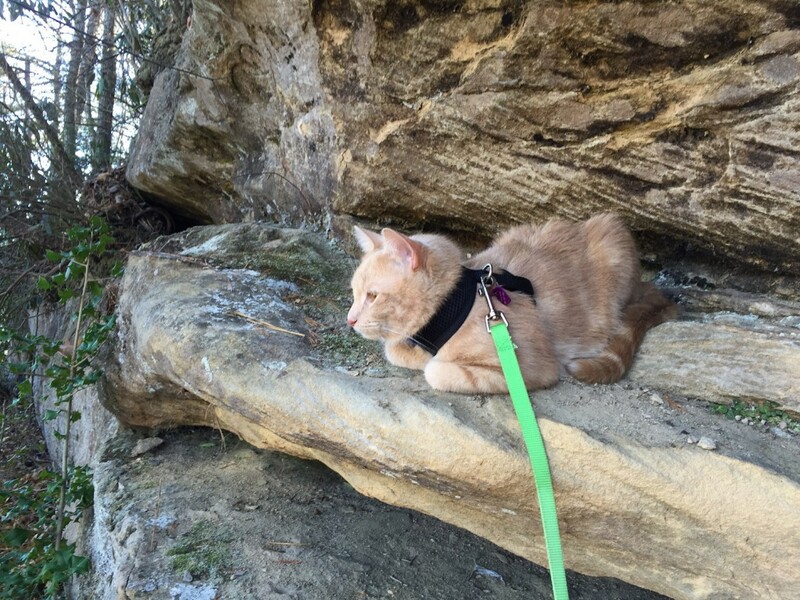 He gets to climb rocks and explore in the woods and chase bugs. 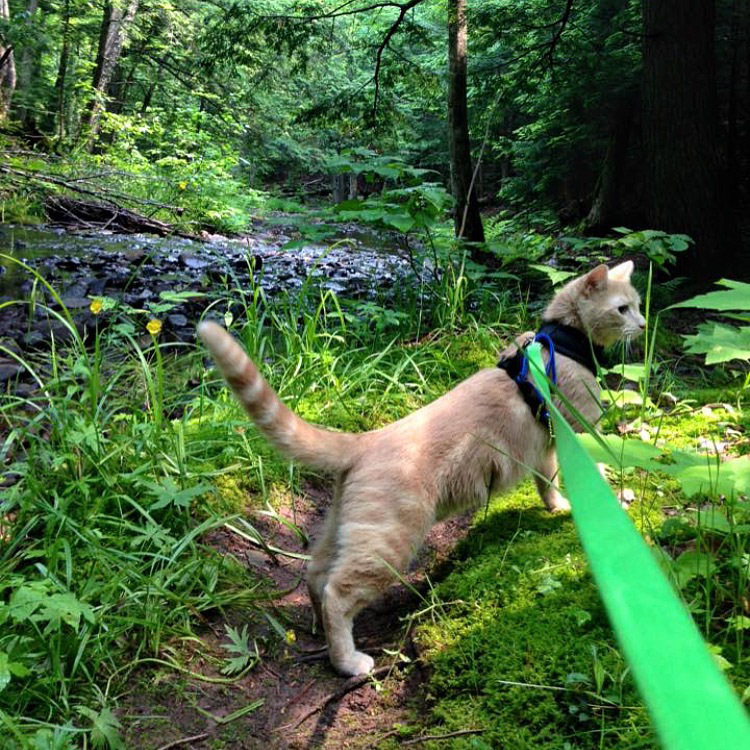 I think adventuring with Mango has been really positive for both his life and ours. 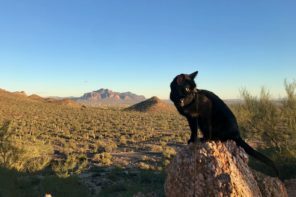 What advice do you have for people who want to take their cats adventuring? Be patient and move at the pace of your cat. 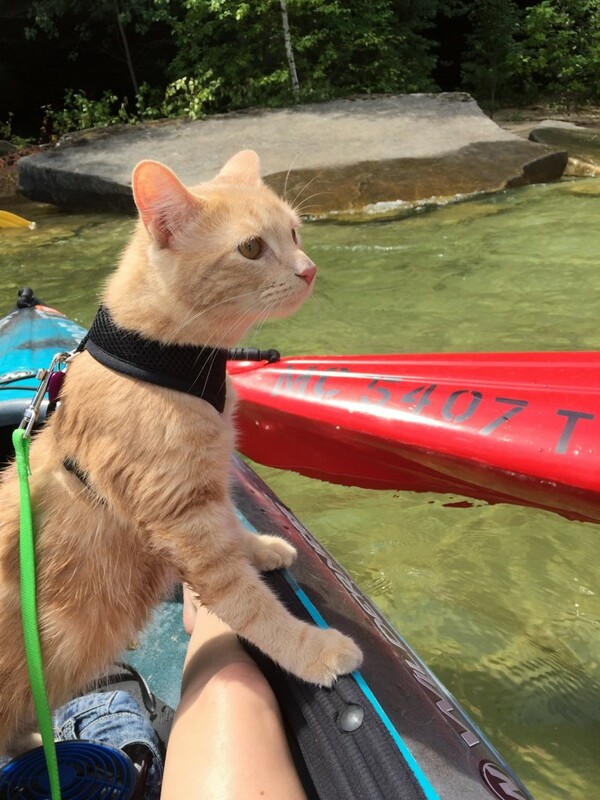 Cats can totally hike, kayak, adventure and the like, and some of them are absolutely awesome at it. But it doesn’t always come easy. You have to be patient and willing to put in the time to show your kitty the ropes. Also I think it is really valuable to expose cats to new environments as frequently as possible; it will only make things easier. Lastly, you’re probably going to have to carry them more than you think —their little legs need a break once in awhile! 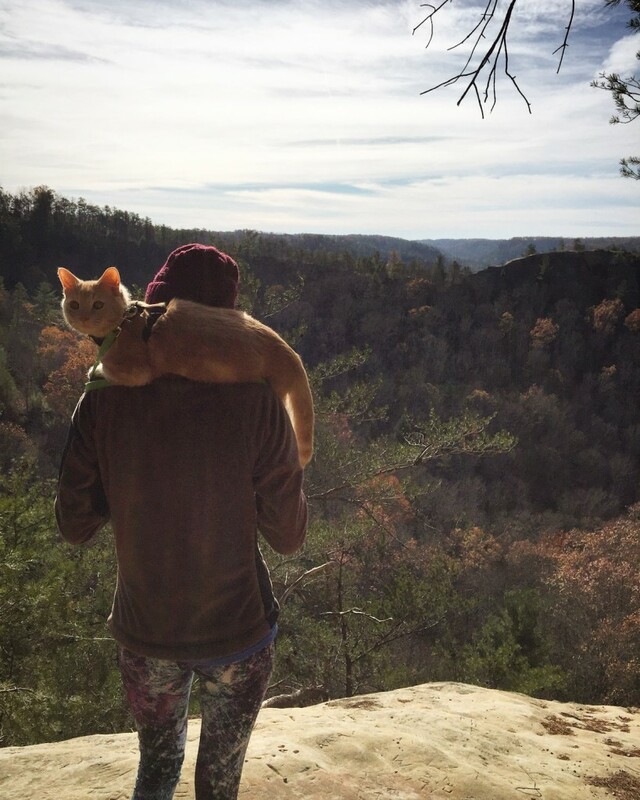 If you want to adventure with your cat, do it. They are so capable and it’s the most rewarding experience. There are so many shelter cats, old and young, that could use a patient human to take them outside and teach them how to have fun. Keep up with all Mango’s adventures on Instagram. Our illustrator was so taken with Mango that she just had to draw him. 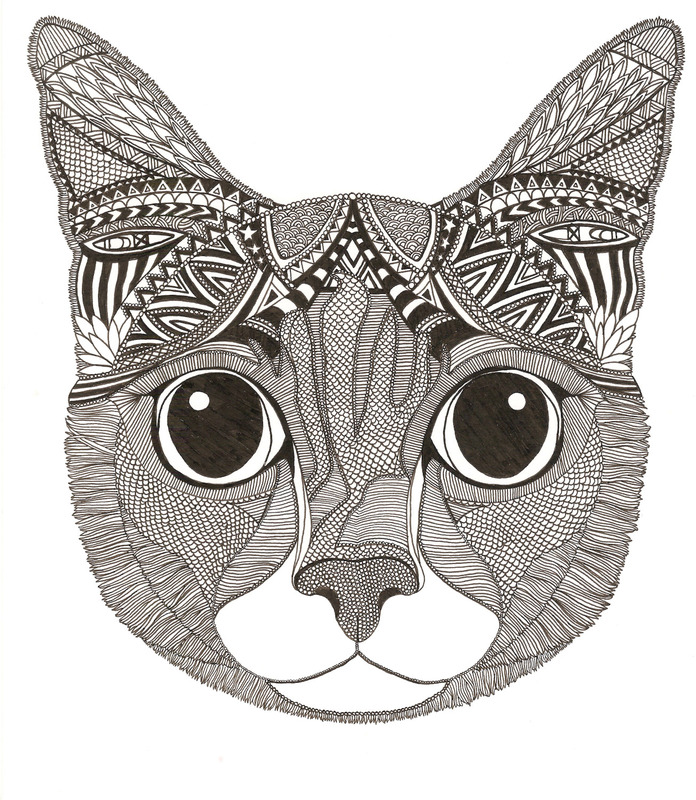 Check out her gorgeous stylized creation below.